Well after being in this Internet game for years, my partner and I had our first full-fledged Digg.com explosion of traffic. I thought it would be interesting to look at how this took place, and what the after-effects of being "Dugg" are in terms of how it relates to the site. So this site that received all of the Digg.com traffic had been following a series of events that were taking place in the industry that the site covers. Basically, there were allegations of cheating and corruption, and we were doing our best to cover it. It was important for people in the industry to get this story out to the mainstream press, so they decided that a Digg would help in getting the story out to the mainstream press. It just so happened that our story was the one that they chose. So I'm looking at our site logs and I notice that we are getting some clicks from Digg.com. We aren't the type of site to submit our own stories to Digg, so this was a bit unusual. I followed the link, and we had been submitted to the Technology subpage, and already had 60 Diggs. I knew that we were going to the Front Page of the site at this point. I emailed our web host and basically said "Get ready." I was a bit worried that they wouldn't be able to stand up to the stampede of traffic, and the site would die. They were really good, and within five minutes responded and said that they were removing all of our quotas, and that they would monitor our site and handle all of our traffic. Aside from a ten minute period where our site was down due to too many MySQL connections at once, they kept their word and the site was up and functional the entire time. Anyways, about five minutes after talking to our web host, we were on the front page of Digg.com, and in the number one position. Traffic absolutely pounded our site, but it remained intact. The biggest bonus for us is the fact that we have picked up a massive 705 new backlinks as a result of this Digg. 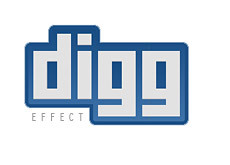 Before the Digg, we had about 400 URL's that had sent us at least one visitors. Now, we have over 1100 for the month. Our traffic since then has been much higher than normal, even though we are hardly getting any clicks from Digg.com anymore. Our traffic for the last few days has been well over 5000 visitors per day. It will be interesting to see how our site performs in the SERP's once Google tabulates all of the new backlinks we have received. It can't hurt.